Durga is an incarnation of Divine Mother, a unified symbol of all divine forces. The name, Durga, in Sanskrit means “invisible.” The name, Durga, formed Du + r+ ga. Du is synonymous with the four devils: poverty, suffering, famine, and evil habits. R refers to diseases. Ga is the destroyer of sins, injustice, lack of spirituality, cruelty, and laziness. Durga killed the powerful demon Mahishasura. Demonic forces (poverty, suffering, famine, and evil habits) are self-destructive, but very powerful. When demonic forces create imbalance, all gods unite, becoming one divine force called Shakti or Durga. “Saptha” means seven and shati means hundred. Seven hundred Durga mantras are chanted in this very powerful Puja. Divine Mother, Durga, who exists in all beings in the form of intelligence, mercy, beauty, who is the consort of Lord Shiva, who creates, sustains, and destroys the universe. Durga is the energy aspect of Lord Shiva. Without Durga, Shiva has no expression. Without Shiva, Durga has no existence. Shiva is the soul of Durga. Durga is identical to Shiva. Lord Shiva is only the silent witness. He is motionless and absolutely changeless. He is not affected by the cosmic play. It is Durga who does everything. Shakti is the power of cosmic energy of the Lord. Divine Mother Durga (Chandi) sits on a lion and is represented as having ten different weapons in her hands. She keeps up the play of the Lord through the three attributes of nature, namely Sattwa, Rajas, and Tamas. The Mother’s grace is boundless and her mercy is unlimited. Her knowledge, infinite. Her power, immeasurable. Her glory, infallible. And her splendor, indescribable. 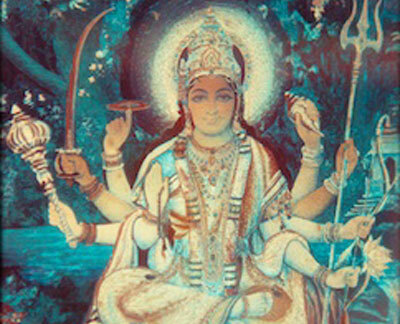 She gives material prosperity as well as spiritual freedom. Approach her with an open heart. If we make a total, unreserved, and ungrudging self-surrender to her, we can kill the enemies of egoism, deviousness, selfishness, and crookedness. 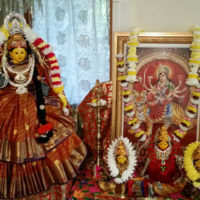 She can be worshipped by singing her praise, and performing kumkum Pujas.